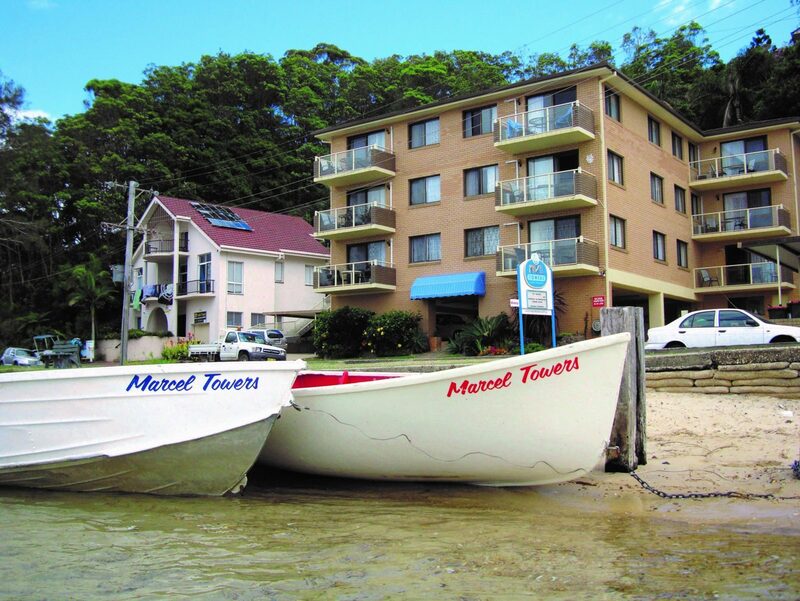 Marcel Towers consists of six two bedroom apartments and six one bedroom apartments, located in Nambucca Heads – part of the inner Harbour known as the Glen, right at the entrance of the Nambucca River to the South Pacific Ocean. 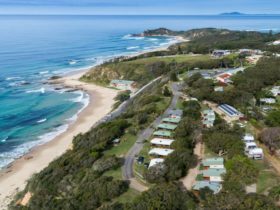 Each apartment is a full sized furnished home unit, with separate bedrooms, fully equipped and self-contained kitchens, bathroom and separate living/dining room. 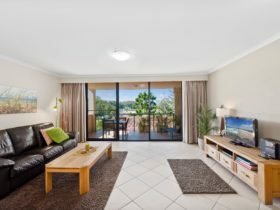 Each apartment has its own undercover off street car parking space, elevated front balcony and spectacular water views with the two bedroom apartments having 180-degree views of the river meeting the ocean. Linen is supplied and some selected apartments are pet-friendly. 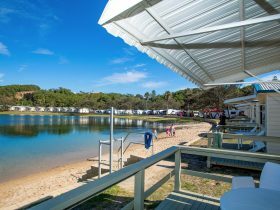 Wifi, row boats, boogie boards, kayaks, snorkelling equipment, books, DVD library, cots and highchairs are available – free of charge. Book tennis courts at reception. This air-conditioned apartment is slightly different to the other one bedroom apartments. It has a queen bed and day bed in the bedroom and the lounge room is combined with the kitchen. It is smaller and really only suited to a couple or two persons with a child. It has a front facing balcony with great views and is actually on the first floor, however at the rear of the apartment there is a small courtyard with balcony. 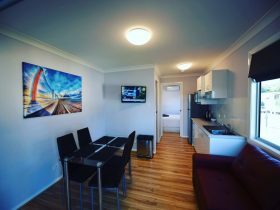 This apartment is pet friendly and if booked in conjunction with the superior apartment, it makes a three bedroom apartment. There is a small charge for any four legged friend per night. This ground floor apartment consists of a queen bed in the main bedroom, two single beds in the second bedroom and a double sofa lounge/other bedding as required. The apartment is slightly smaller than the other two bedroom apartments but makes up for it. 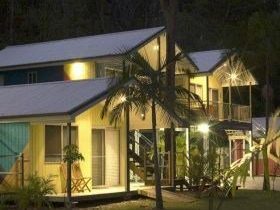 It has Austar, air-conditioning and an attached garage with a washing machine and clothes dryer. The views from the porch are wonderful. This apartment is pet friendly, however there is a small charge for any four legged friend. This apartment is very popular with elderly and disabled guests. One bedroom apartment consists of a queen bed in the bedroom and a single bed in the lounge room. The one bedroom apartments can sleep four and extra bedding can be supplied. 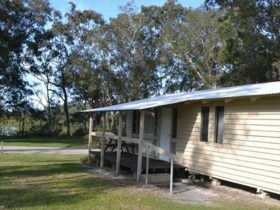 There is a separate fully self-contained kitchen and separate lounge room. 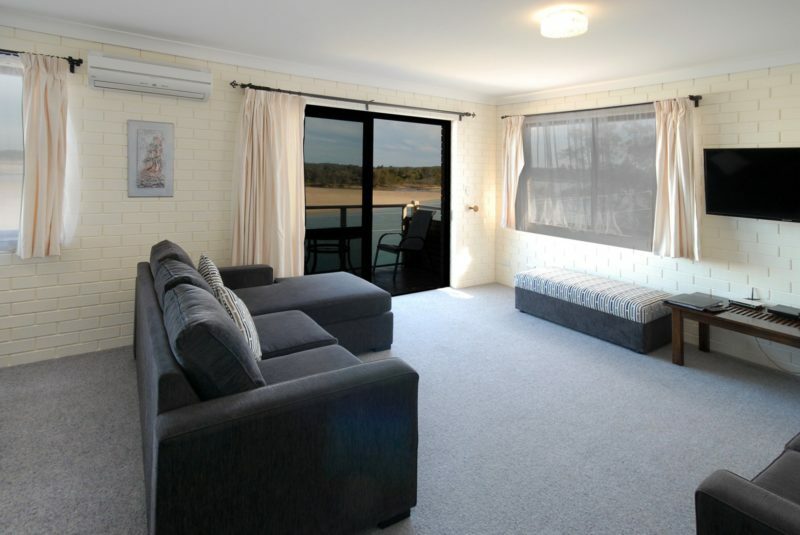 All the apartments are spacious and comfortable with a front facing balcony overlooking the river. One bedroom apartment consists of a queen bed in the bedroom. The one bedroom apartments can sleep four and extra bedding can be supplied. There is a separate fully self-contained kitchen and separate lounge room. All the apartments are spacious and comfortable with a front facing balcony overlooking the river and ocean. There is a queen bed in the main bedroom with a television, three single beds in the second bedroom, two of which may be zipped together to make a king double bed. The apartment is fully renovated and used to be the manager’s apartment. There is a fully equipped kitchen with a dishwasher and a very comfortable lounge. The balcony has one of the best views in the apartment block, overlooking the river meeting the ocean and is adjacent to the large sand island right at the front of the apartments. The apartment is located on the first floor, with an easy flight of steps. This apartment can also be connected to the courtyard apartment through two adjoining doors, making a three bedroom apartment. Consisting of a queen bed in the main bedroom, two singles in the second bedroom, with divans as required (to sleep 2 extra people). 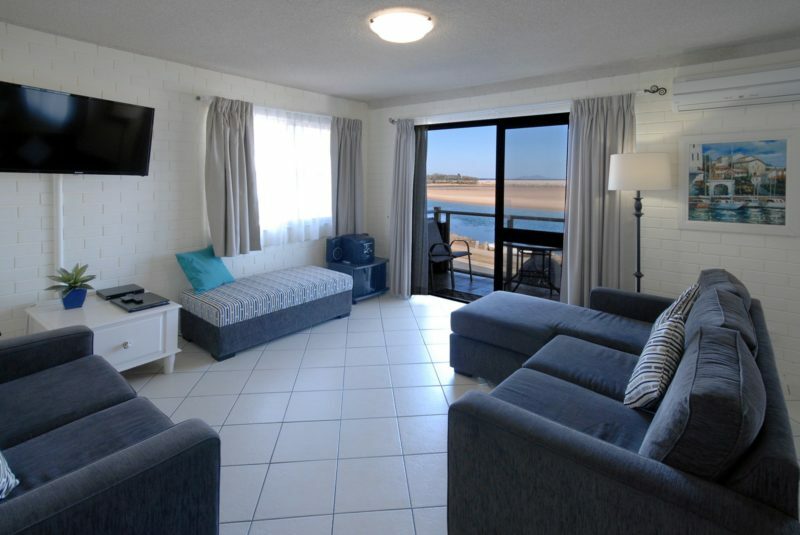 The two bedroom apartments are located at the front of the building and each have a balcony with 180 degree view of the river meeting the ocean. All the apartments are self-contained and most are fully renovated. All are air-conditioned, spacious and comfortable. Charges subject to change/availability. Rates are for two guests. Extra guests AUD15 (infants excluded). Linen provided.